After years of being undervalued, 2015 saw unprecedented international recognition of the role of public spaces in sustainable development in the 2030 Agenda, thanks, in part, to the advocacy of local government networks. Target 7 of SDG 11 on sustainable cities and human settlements is to “provide universal access to safe, inclusive and accessible, green and public spaces, in particular for women and children, older persons and persons with disabilities.” Public space is also a key component to achieving SDGs 3, 5, 6 and 13. The Habitat III Conference in Quito is set to reinforce the role of public space in sustainable urban development still further in October of this year. But local governments are one step ahead of the international agenda on public space. Over recent years, the UCLG Committee on Urban Strategic Planning (CUSP) has been organizing peer learning activities to allow local governments to learn from on-the-ground experiences of planning and managing urban spaces across the world. “A learning event enables cities to learn innovative ways to engage public in the conversations about public space” Puvendra Akkiah, Technical Chair of the UCLG Committee on Urban Strategic Planning, City of Durban. CUSP has organized international peer learning events on public spaces in Durban, Porto Alegre and Blantyre. The experience helped Porto Alegre to promote spontaneous initiatives in public space, triggered the engagement of Blantyre in smart cities initiatives and helped Durban put people first in the creation of public space. The Committee's next learning session on public space will be held at the World Summit of Local and Regional Leaders in Bogotá (12 to 15 October 2016). Don't miss this opportunity to share and gain knowledge on public space and its role as a social, economic, environmental, spatial and cultural lever for local governments. 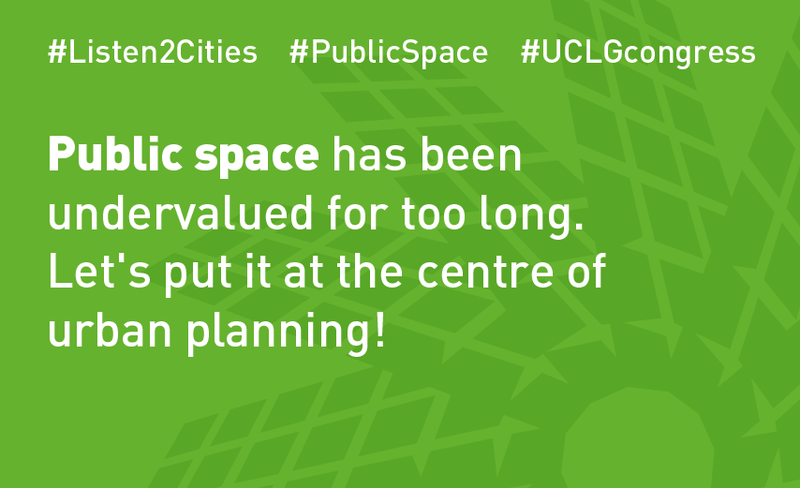 If you believe that quality, accessible and safe public spaces are a powerful tool to make our cities better places to live, join the conversation on Twitter using the hashtags #UCLGCongress and #PublicSpace.